The Lower Modernisms – 032. Lomo Featured Projects: Cafetales formerly known as Sheri’s Restaurant, Inglewood, and Brolly Hut, Inglewood. 2011 Googie Coffee Shops Bicycle Ride Series, October Ride. November 9, 2011 by James Black. 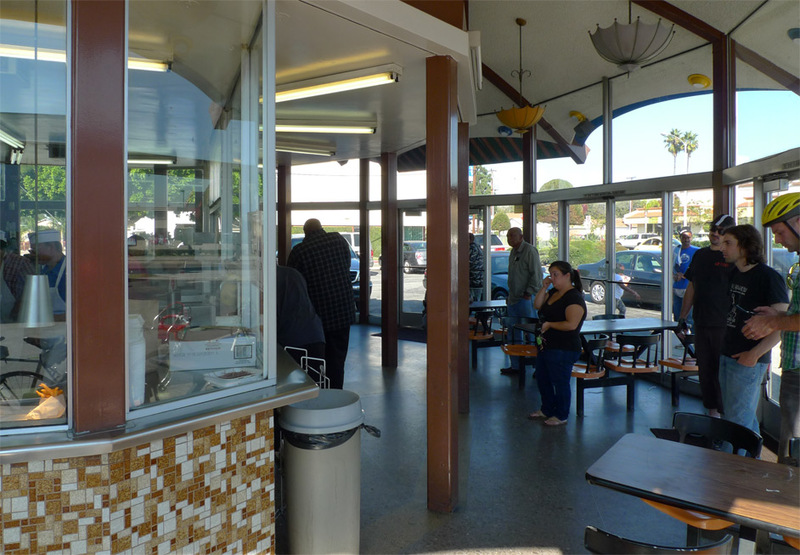 The October installment of the Googie Coffee Shops Bicycle Ride Series was nominally destined for Cafetales, a Pupusería on La Brea Avenue in Inglewood, but the ride, relatively well attended with 11 riders, expanded into a miniature Tour of Inglewood. This city is a remarkable place for enthusiasts of the Modern. Much of the existing city fabric was developed in the 1950s and 1960s when Inglewood was relatively affluent (not to mention white and racist); subsequent demographic shifts have left Inglewood relatively poor compared to neighboring South Bay and Westside areas, and with a high proportion of renters. This development pattern is inherently preservationist, as diminished redevelopment pressures have crystallized many of those nice 1950s and 1960s buildings. Once a city of the future, Inglewood now shelters abundant artifacts of futures past. Our first detour took us past the “Chateau Dianne” apartment building at 905 Edgewood Street. 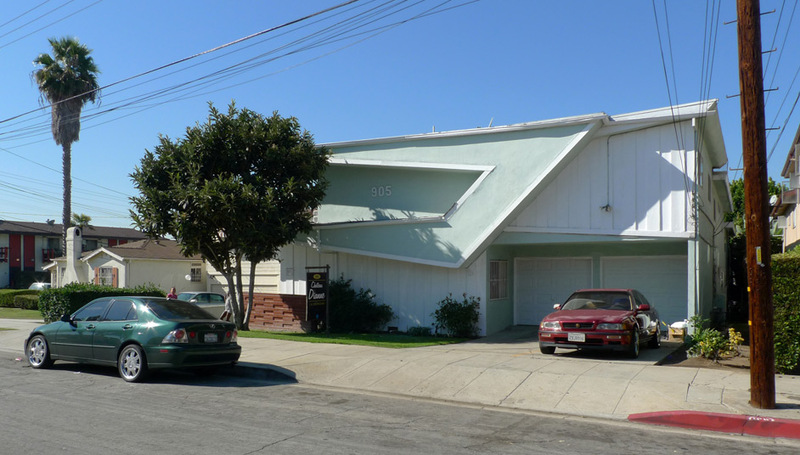 One of the most unrestrained and gratuitous of Googie-izing dingbats in town, this “halfbat” features an expressively modeled front, evoking the folded-plate roofline of a Googie coffee shop, but in true dingbat style this wild form is a false front, only a couple of feet in depth. 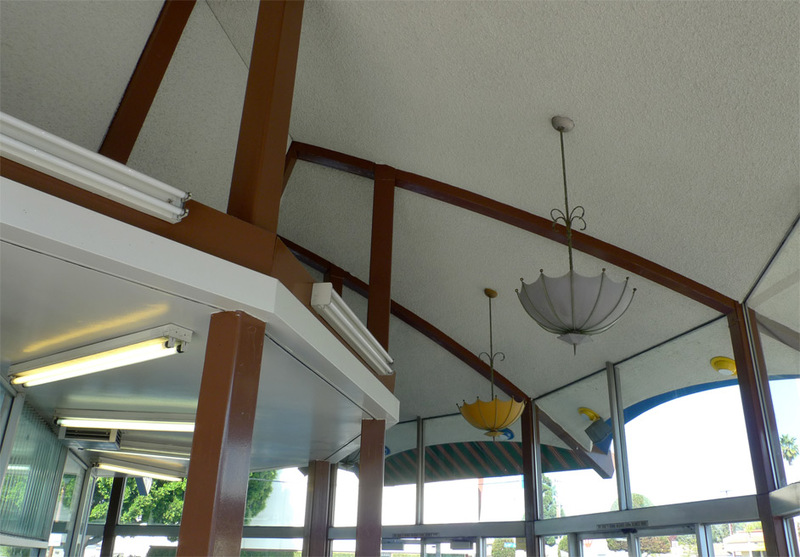 In the index of buildings at the end of Googie Redux (page 200), Alan Hess attributed the discovery of this building to John Beach (co-author of “The Stucco Box” with fellow LoMos Patron Saint, John Chase). Reversing the high-modern model, with a building like this one the hero is not the architect but instead the observant architectural otaku who discovers the hidden treasure. Corrugated galvanized sheetmetal covers up all the tasty flagcrete, and the aggressive colorway strikes the wrong note, but the building is still largely intact. The angled roof form expresses the shape of the structural truss presumably contained within it. 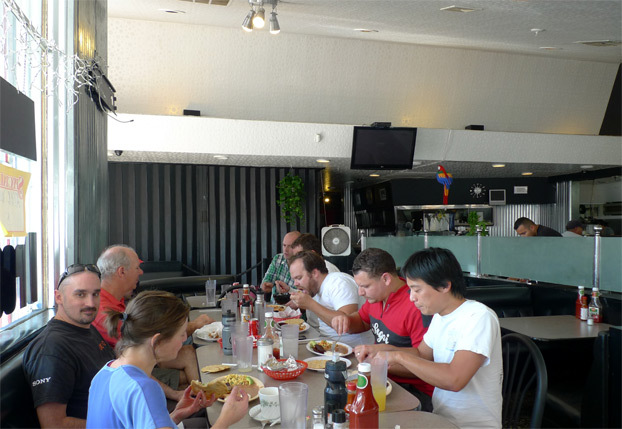 In addition to the traditional American breakfast favorites, Cafetales has a full line of Salvadorian menu items – the pupusas were great, oily and enjoyable. The monochromatic interior contrasts with the exuberant colors of the exterior, although it still manages to look garish with all that shiny corrugated metal. The grey-tone terrazzo looks great. The interior organization does not follow the typical Armét and Davis sectional diagram. Still recognizably Googie in its elements, the composition is looser and more free-form. The sloping ceiling planes break up the space, but it slopes downward, contrary to the traditional Armét and Davis model. 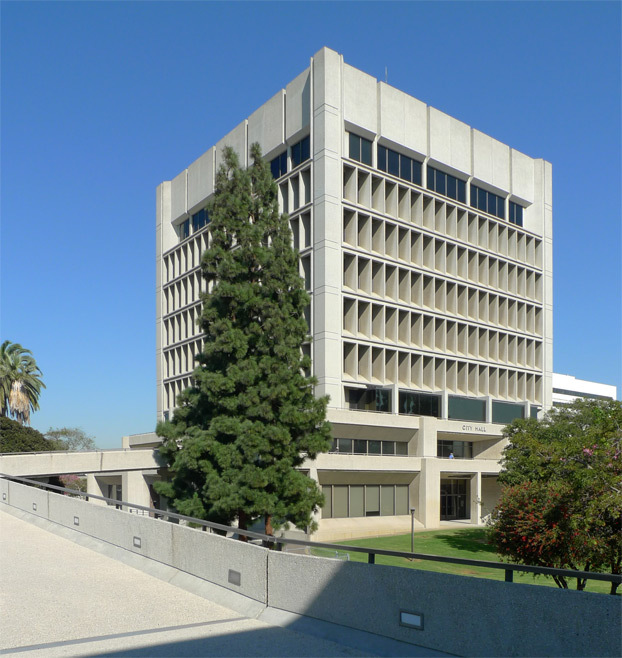 A block away from Sheri’s/Cafetales stands the Inglewood Civic Center, a high-modern complex of elegant, brutalist-lite concrete buildings stitched together by a network of streets-in-the-sky (and therefore a fun place to ride around on a bicycle). Charles Luckman, also the architect of another famous Inglewood landmark, The Forum, designed the Civic Center complex. It was completed in the early 1970s and it feels like the last gasp of institutional futurism. The last stop of the day and surely its highlight was the Brolly Hut. 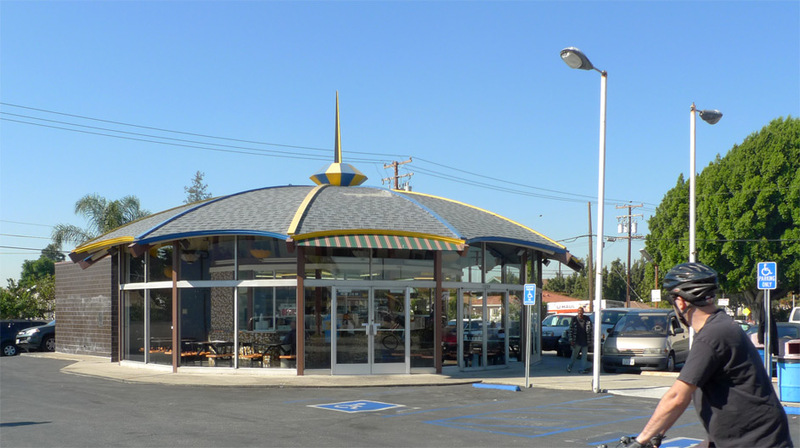 Neither Googie nor a coffee shop, Brolly Hut is a hamburger stand in the shape of a brolly. Typologically it is in the family of free-standing char-broiled burger shops, but architecturally it is in a class of its own, a standard-bearer for what the Lower Modern could achieve. 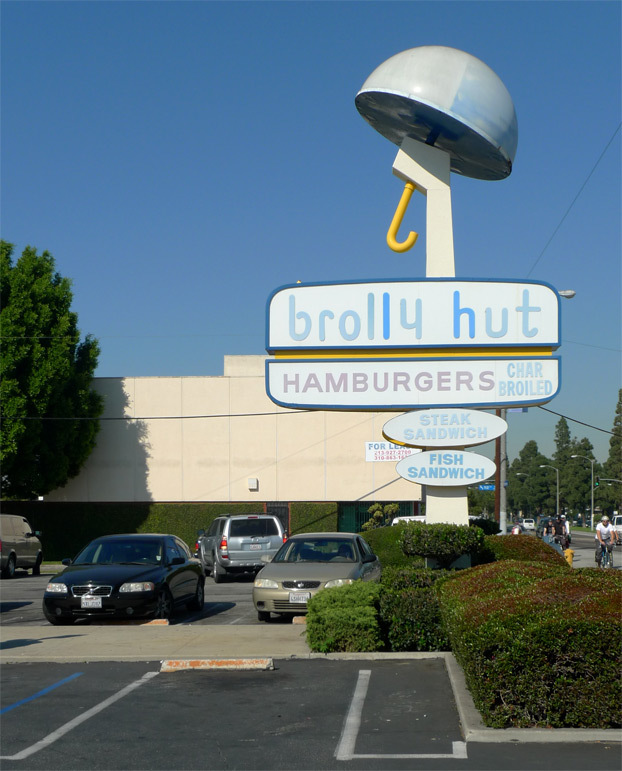 According to internet lore (the LA Conservancy’s Flickr stream), Brolly Hut was designed by Victor Miller in 1968. The sign alone is a winner – an arm extends from out of a hamburger holding a jauntily-tilted brolly, the colors faded perfectly, the lettering of “brolly hut” inimitably perfect. Shaped like an umbrella, Brolly Hut is aptly named. The bright colors and outsized objects achieve the playful feel of a miniature golf course. The interior feels like a pavilion. The post and beam structure holds up the domed roof as well as a flat soffit that subdivides the tall volume and reinforces that sense of roundness. The dining room feels open, yet sheltered… as if by a giant umbrella. Umbrella light fixtures hung overhead while I ate onion rings. Late getting to your party, but found your site while looking for Googie in Inglewood. 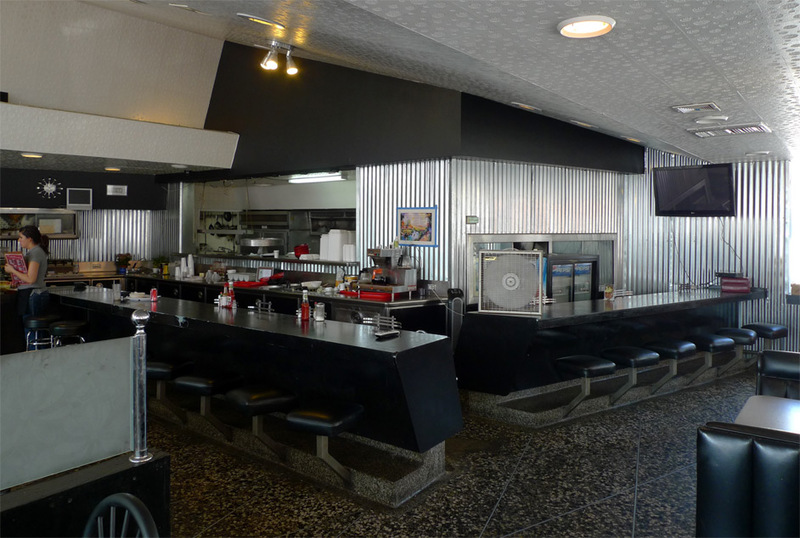 Am working on an article about Googie in Inglewood for a new newspaper in towm. May I use your photos and note your tour? 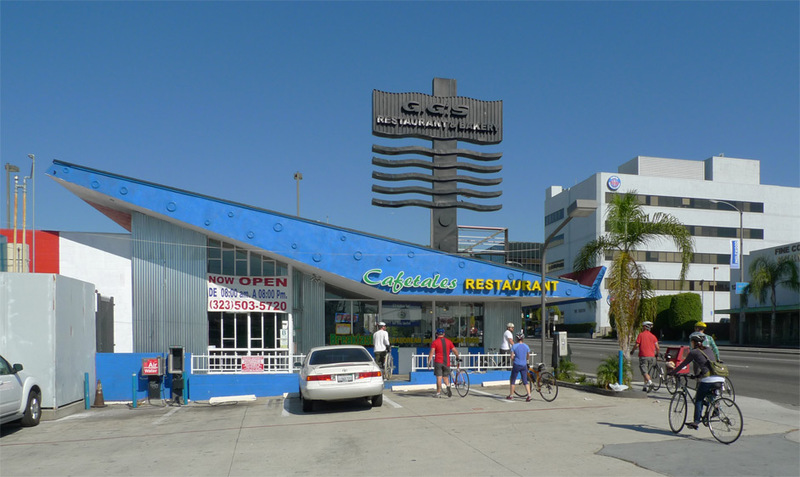 We have googie style car washes in Inglewood, too, but I’m sure you know about them. Good things are happening in Inglewood and historic preservation is one of them. please be in touch and I’ll be glad to keep you posted on Things Inglewood.